The traditional way for local Native Americans to cook food here in Northern California was by heating up stones and then stirring them in their baskets. Rocks are wonderful heat sinks retaining their temperature for a long time. That’s the premise behind tea stones. 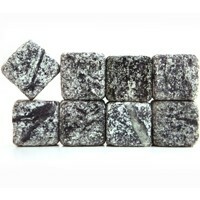 Cubed stones that can chill or heat any cup of tea are the perfect gift for any beverage aficionado. Milled from sustainable Vermont soapstone, the stones are eco-friendly and are a must have in any gourmet kitchen. You can heat these stones in your microwave or oven, then place them in your tea to keep the beverage warm. Likewise, you can chill them in the freezer and use them like ice cubes, yet they don’t melt and water down your drink. Actually, the stones we were sent are packaged as [amazon_link id=”B008YERRBO” target=”_blank” ]Whiskey Rocks[/amazon_link], but clearly, they can be used for any beverage hot or cold. I really like these tea stones. They are great for hot or cold tea, and I think they make a truly unique, eco-friendly gift for your loved ones. Ito En also has a lot of other great green gift ideas.